The acanthaceae garden is one of the most colorful collections of its kind in Hawai'i. There are many colorful herbs, shrubs, and vines in this plant family. Most of the 2,500 species are found in the tropics. The four main areas of distribution are Africa, Indonesia, Brazil and South America. Considering the immense distribution throughout the world it is curious that there are no native Hawaiian species. 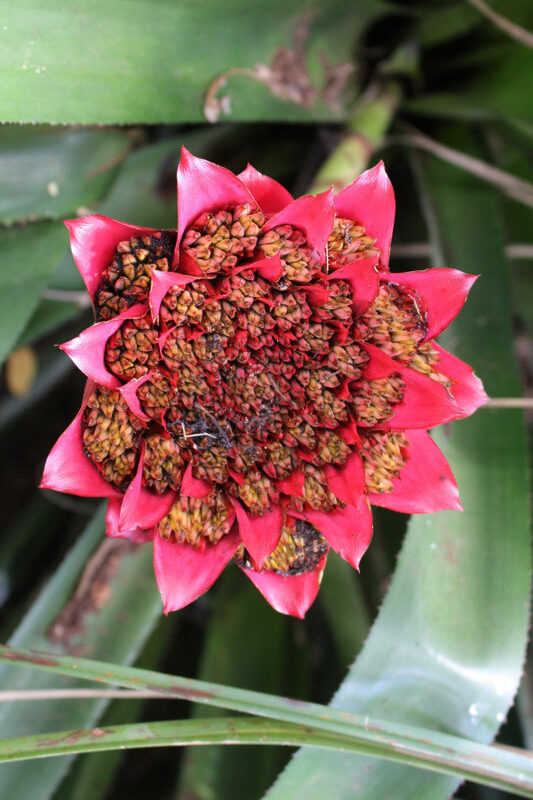 All the plants found in this garden are from other tropical spots throughout the world. Two outstanding genera in this collection are Schaueria and Aphelandra. Another plant, the squirrel tail, is popular in Hawai‘i for making leis. 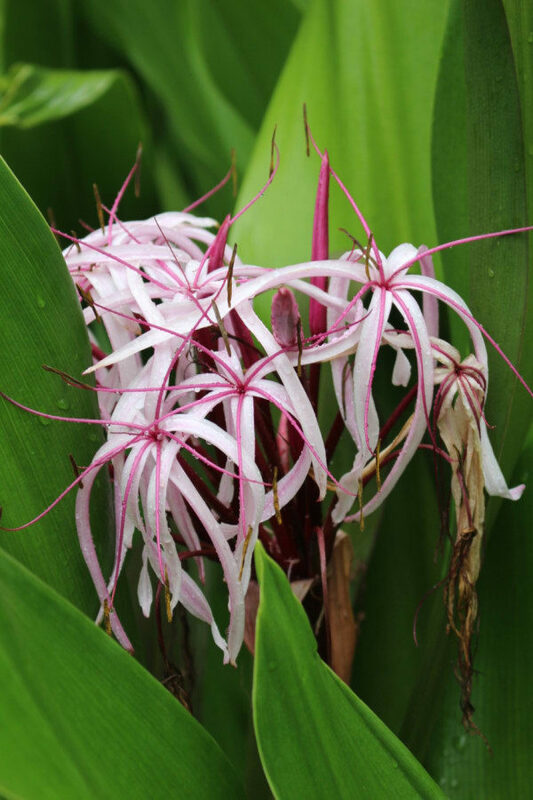 The amaryllidaceae are a family of herbaceous that has over 1,100 species, but the Crinum, or spider lilies, are especially favored in this garden. 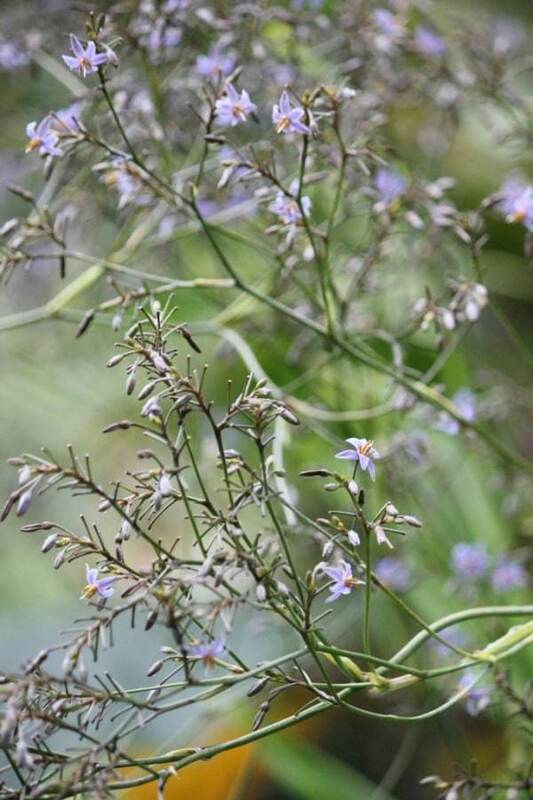 Efforts are underway to preserve many of the unusual and rare plants. This collection is one of the largest in the world. 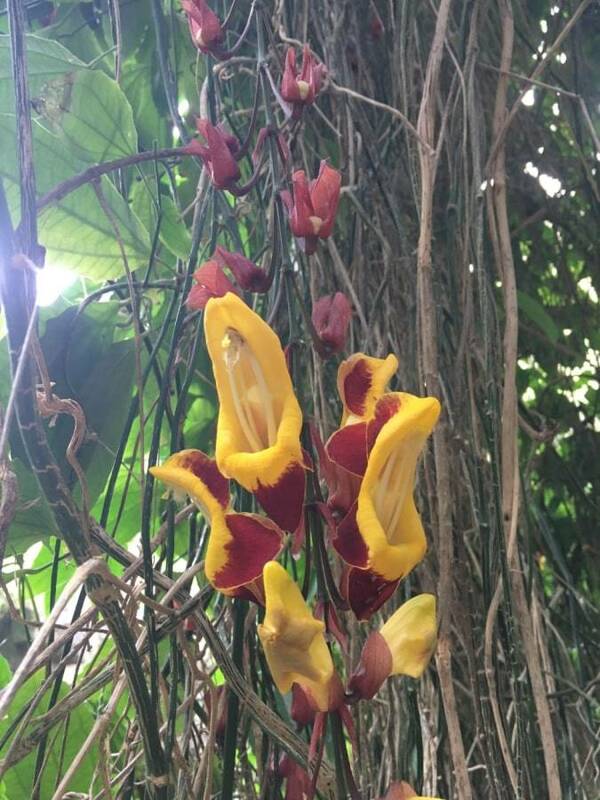 These herbaceous (non-woody) plants are found in tropical rainforests around the world. With nearly 2,000 species divided into 115 genera the aroids are one of the largest plant families with an astounding variety of form. They often display striking foliage and unusual flower structures. Many are popular as houseplants for their ability to thrive in shady areas. Colocasia, a ground-dwelling herbs have starchy roots like the edible kalo (taro), a staple for 400 million people of the tropics. Many, like the Philodendron, are climbing vines with aerial roots for support in addition to their normal ground roots for nutrition. 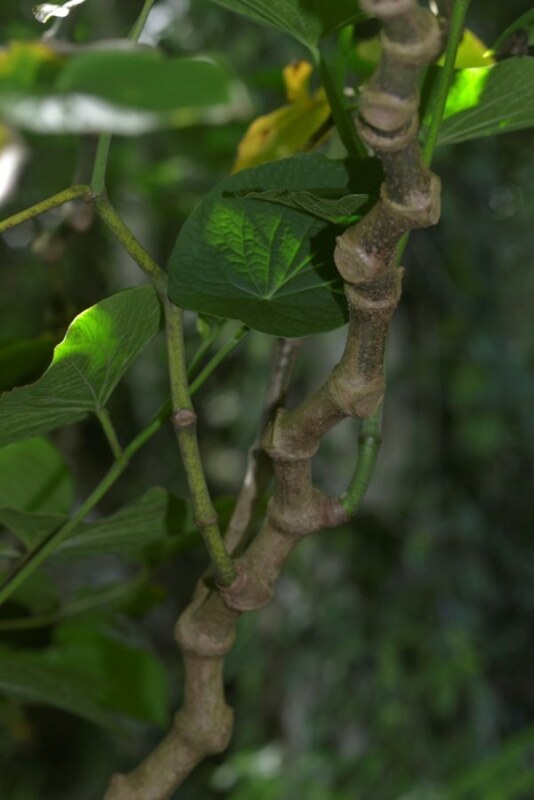 Some climbing aroids have leaves which change in size and shape when they start to climb up a tree. 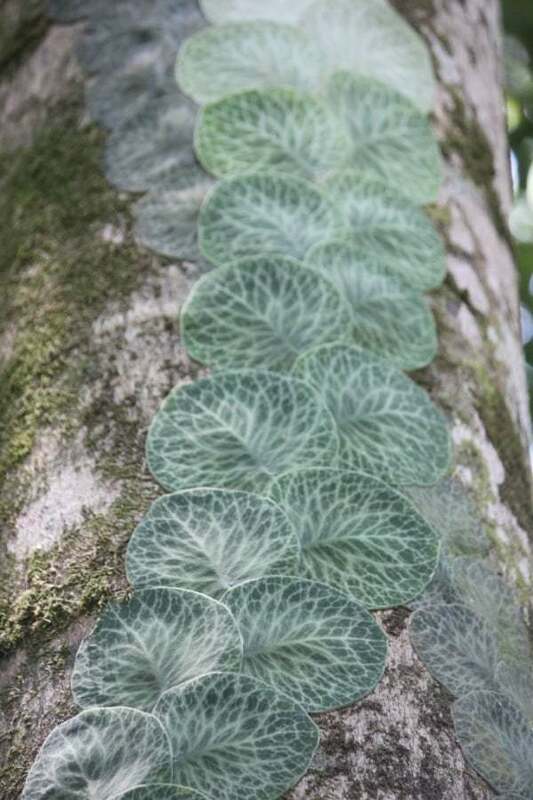 The leaves of the pocket plant, Xanthosoma, act as reservoirs. The monstera, which has a pineapple flavored fruit, has holes in its leaves. Anthuriums are epiphytic aroids that do not have ground roots. Found on branches or in leaf litter in the wild their nourishment comes from air. There are two separate gardens of aroids (plants in the Araceae family). One is across from the Hawaiian plant collection on your way to the first bridge. The second is reached by descending the first flight of stairs on your left across Kauhale on the Central and South American Trail by Kamananui Stream. The palm family is one of the oldest groups of flowering plants. Fossil records show that they dominated the mid-cretaceous forests 80 million years ago. Today nearly 2650 species can be found in the tropics and warm temperate regions. They have adapted to widely varying habitats from seashores to mountaintops and from deserts to steamy jungles. The fruit and other vegetative parts provide edible oils, starches, and sugars. As well as medicines, waxes, fibers, and thatching material. Examples of economically important produces are coconuts, dates, Carnauba wax and rattan. Both the American and African oil palms are on display here. Only one genus of palms existed in Hawai‘i before the arrival of man. The loulu or pritchardia palms diversified into many species, each adapted to a specific region on one or more of the islands. The palms in this garden are divided into 15 sections according to different evolutionary characteristics. Our native loulu palms are planted on separated beds in the Palm Meadow, each shaped like the Hawaiian island where that loulu is native. 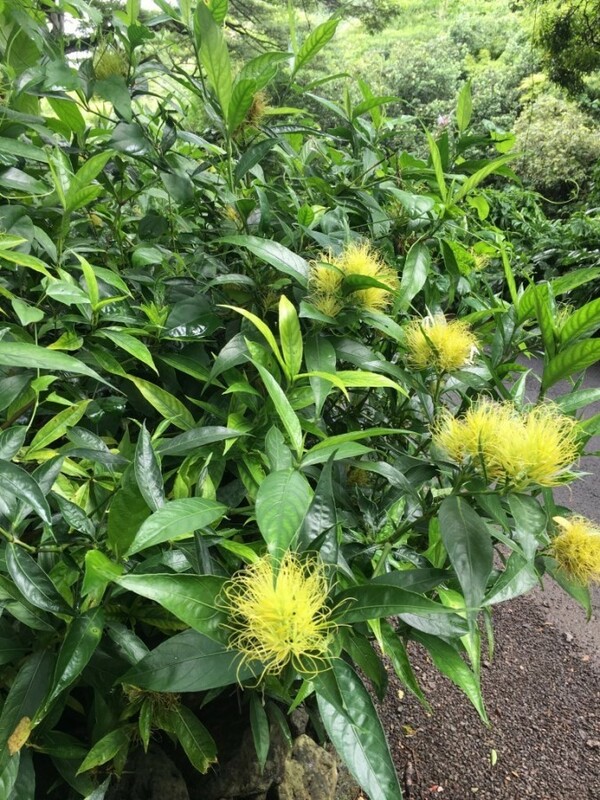 The lei garden consists of plants that produce flowers, seeds, and leaves that include color, fragrance, lasting quality, and rarity for lei making. Today, in Hawai'i, the lei is a symbol of friendship, love, and trust. It is offered as a gift of honor to friends and visitors. The connection to its origins goes back to Southern Asia, after many hundreds of years of migrating form island to island eastward across the vast Pacific Ocean, bringing with them the arts and traditions of the lei, which generations before them had developed on the continent of their origin. The materials of lei making were substituted, the reasons for and the rituals of the lei suffered changes also as people moved from place to place. A greater and richer variety of leis was made in Hawai'i at this time than in any other Polynesian group. Most plants in this garden bloom profusely in March and September. 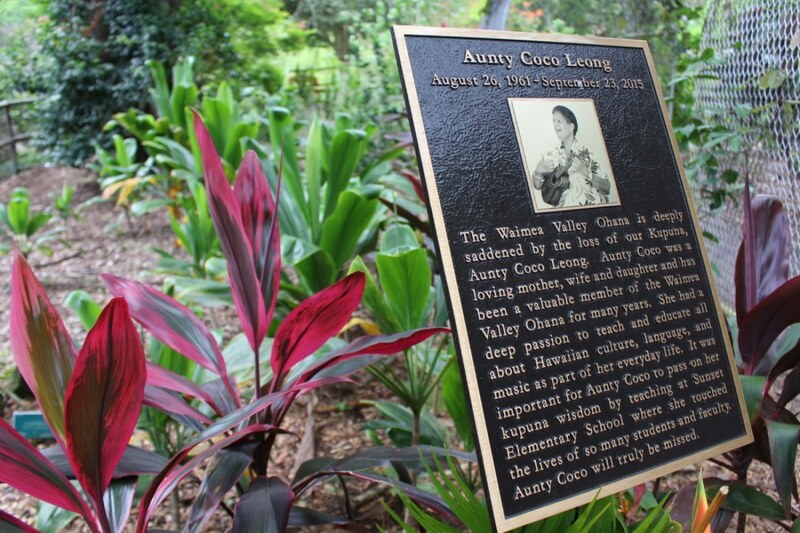 The lei garden is dedicated to our beloved Waimea Valley Ohana member and Kupuna, Aunty Coco Leong, who passed away in September of 2015. Her deep passion to teach and educate Hawaiian culture through music and language will never be forgotten. Bamboos are actually giant members of the grass family, Poaceae. At least 1500 species can be found widely distributed in the topics and warm temperate areas of the world. 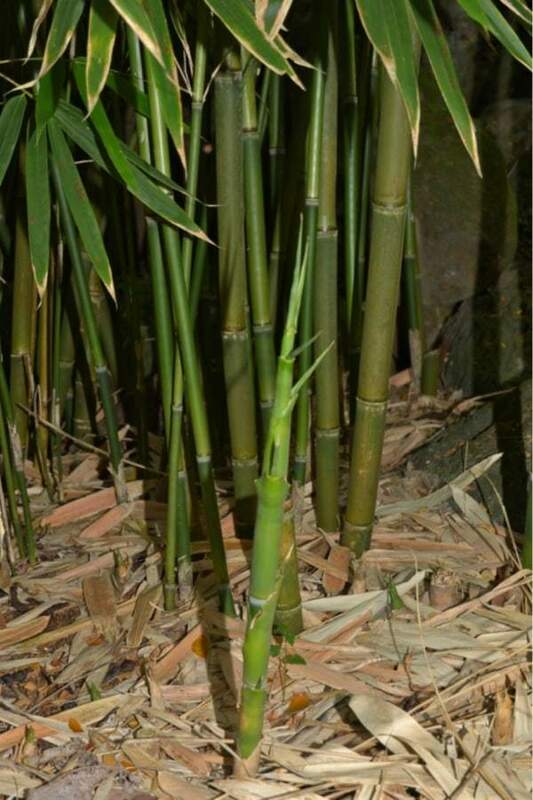 Bamboos are the fastest-growing woody plants with some towering over 60 feet high. Many selections are highly prized for their variegations, and unusual stem shapes. Next to palms man uses the bamboos more than any other plant family. They are unsurpassed for building construction and scaffolding. Artisans use the fine-grained wood to create farm tools, musical instruments, brushes, baskets and limitless handicrafts. Bamboo is the sole food source for the Giant Panda of China and in many oriental dishes the tender bamboo shoot is indispensable. The Begoniaceae family of perennial herbs and shrubs is found in every tropical region of the world. Begoniascan are usually recognized by their asymmetrical leaves and succulent jointed stems. Their tiny seeds account for their wide dispersal, even to places as remote as Hawai'i. The endemic genus Hillebrandia is endemic to the islands. 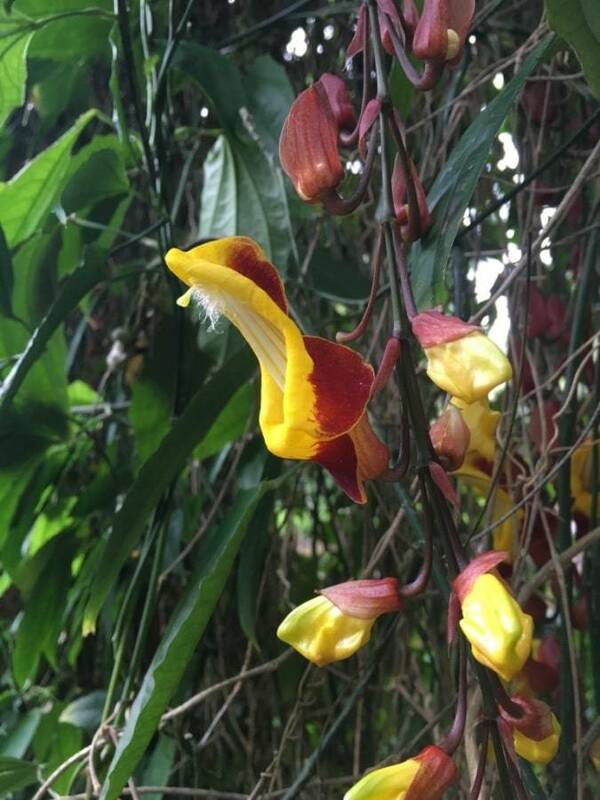 Some of the most brilliantly colored flowers in the plant kingdom can be found in this family of nearly 750 species. 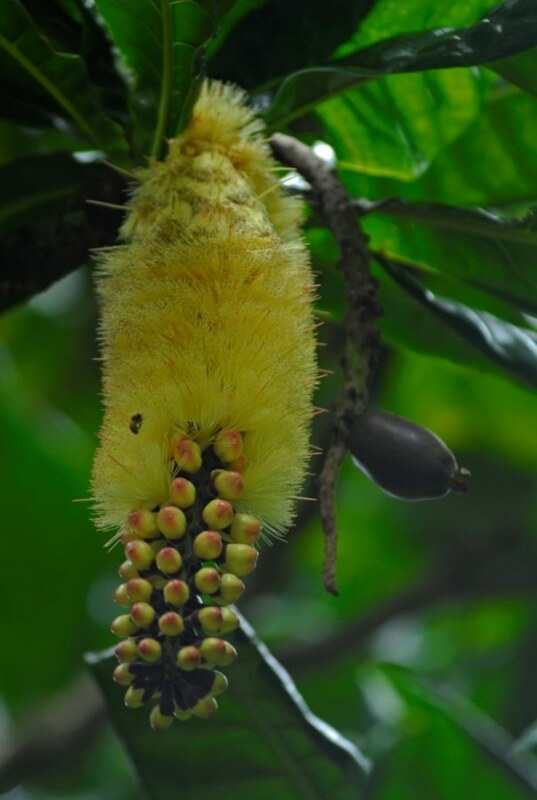 Most evolved in tropical South America, and in a surprisingly wide variety of forms, from trees and shrubs to herbs and woody vines. The showy asymmetrical flowers are typified by the African tulip tree, the Jacaranda, J. mimosifolis, and the many species of Tabebuia. 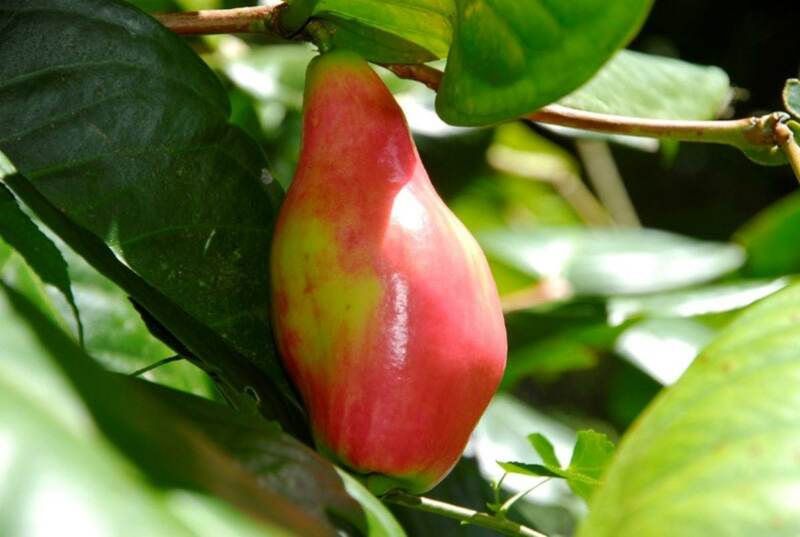 The fruit, usually not palatable to people, sometimes take unusual shapes that give the calabash tree, the sausage tree, and the candle tree their common names. Although some species yield durable hardwood most are cultivated as ornamentals for landscaping. While there are over 1,400 species known it is often called the pineapple family after the best-known member of the family. Most of these plants are from the West Indies and tropical America, except for Pitcairnia, which is native to West Africa. The plants range in size from less than one inch, like Tillandsia, to huge plants with flower spikes over 10 feet high, like Puya. In addition, these plants can grow not only at sea level but also up to elevations over 1,400 feet. Many plants like the pineapple are terrestrial, which grow in the ground. However, others are epiphytes, which grow on tree branches and even on the stems of desert cacti. Central and South America The Central and South American floral area includes the vast Amazonian rain forest, the savannahs of Argentina, the high plains of the Andes, the coastal jungles of the Caribbean, and the deserts of Chile, Peru and Mexico. The number of plant species in this range of habitats is so great that botanists have no actual count! There are important edible, medicinal, and economic plants in Central and South America, but vast areas are being destroyed by man’s search for timber and natural resources such as gold and oil. New roads are opening remote areas for colonization, and primary forests are being shortsightedly cleared for cattle ranches. Entire plant communities are being disrupted and large numbers of species are rapidly dying out before they can be studied. Chocolate, vanilla, peppers, rubber, tomatoes, and potatoes all come from this part of the world. Botanists are racing against time to study equally promising but little known plants facing extinction. Among them are medicinal and shamanic plants used by native cultures, nutritious food crops that can tolerate drought and poor soils, and trees that yield sap like diesel oil. 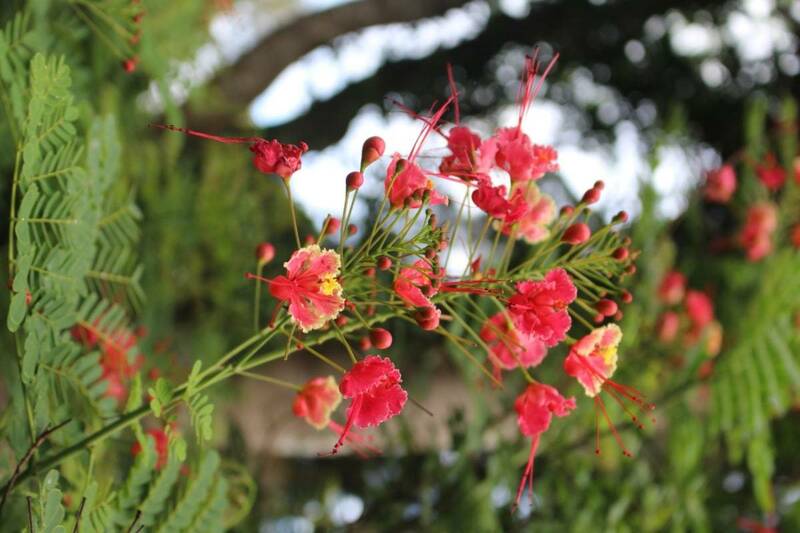 The Wiliwili tree can grow up to 30 feet high and its bright red seeds are used in lei-making. The lightweight wood of the Wiliwili was used by early Hawaiians to make long boards (alaia), short boards (olo), fishnet floats, and is still used for outrigger canoes. The tree originates from the tropics, and warm temperate areas like the Himalayas and Argentina. There are over 114 species and varieties, widely distributed throughout the world. Waimea had one of the world’s best collections of these genus until a microscopic wasp found its way to Hawai'i in 2004. In Hawai'i, the popular Wiliwili tree, E. sandwicensis, had been decimated. Even old trees growing in the Valley from long before the botanical garden were established, are on their last legs. 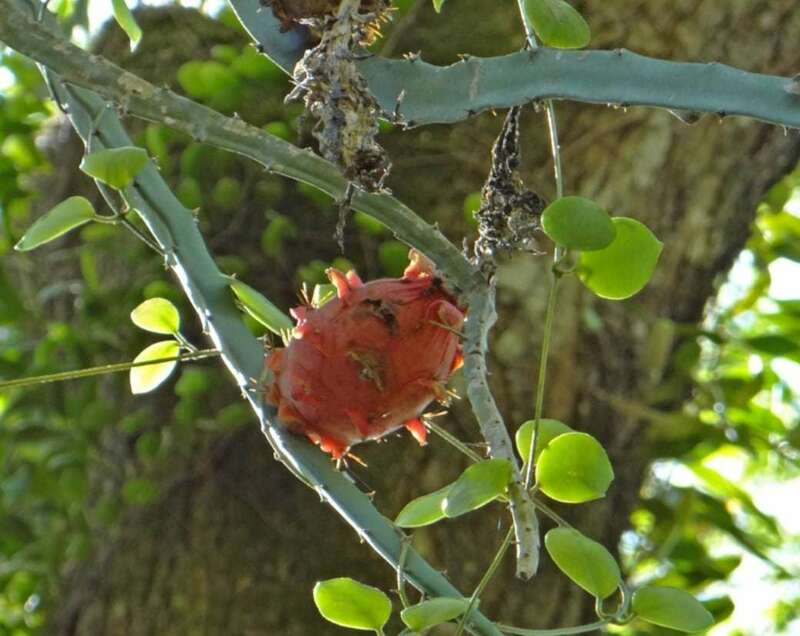 The Erythrina Gall Wasp lays its eggs on newly emerging leaf and flower buds, which then swell to grotesque shapes. In December of 2008, another predator wasp was released as a bio-control. 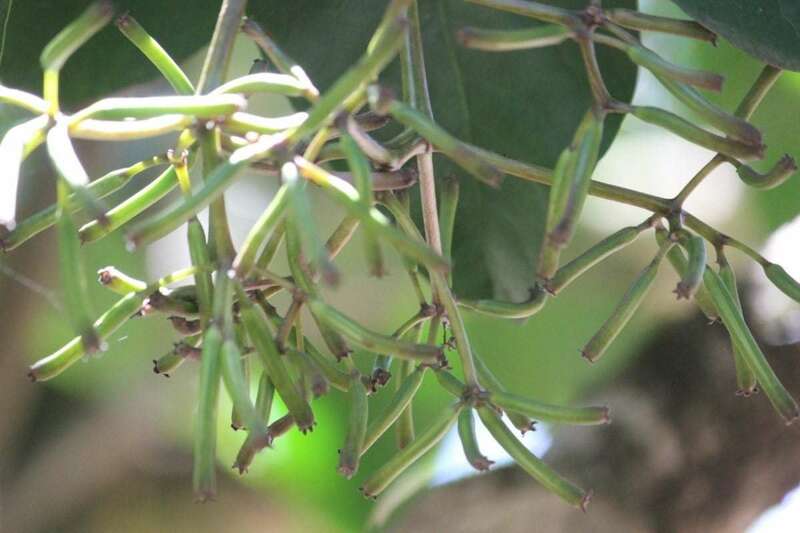 There is now a dynamic balance between these two alien wasps in Hawai'i has helped with the survival of the Wiliwili trees. Ferns are a very primitive group of flowerless, spore-bearing plants divided into about 20 families and 300 genera. The nearly 10,000 species we know of are survivors among the millions that evolved and went extinct long before flowering plants appeared on Earth. Coal deposits are the carbonized remains of the vast fern forests of the Devonian era. 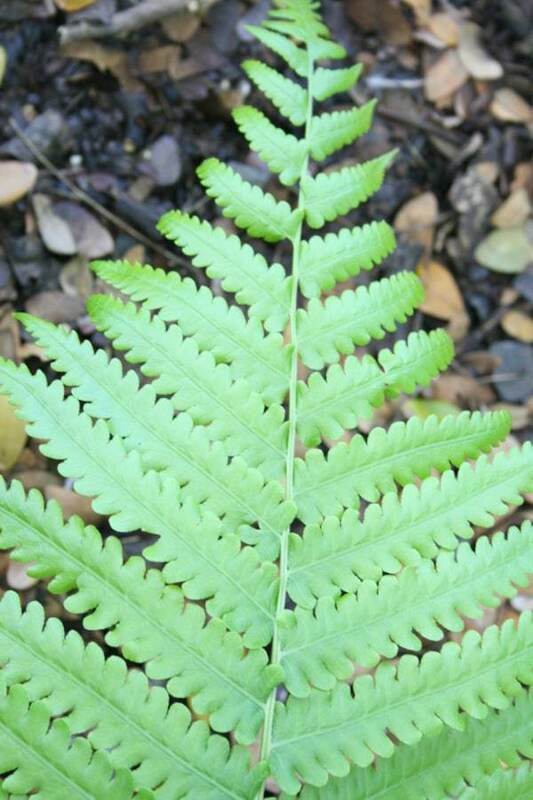 Take a look at our Native Fern collection near the Pikake Pavilion. The islands of Fiji lie about two-thirds of the way from Hawai'i to New Zealand. There are about 500 named islands, rocks, and atolls with a total land area of more than 7,000 square miles. The two largest islands, Viti Levu and Vanua Levu, account for 87% of the land area. Around 100 of the islands are inhabited. Most of the people are either the original Melanesians or descendants of plantation workers brought from India 100 years ago. Most of the islands are volcanic and mountainous but some are low limestone or coral formations. There is a tremendous diversity of climatic zones, soil types, and elevations resulting in very different floral habitats. Like Hawai'i, the islands are isolated from large land masses and unique flora and fauna have evolved, which can be found nowhere else. Many are already threatened by the burgeoning human population. 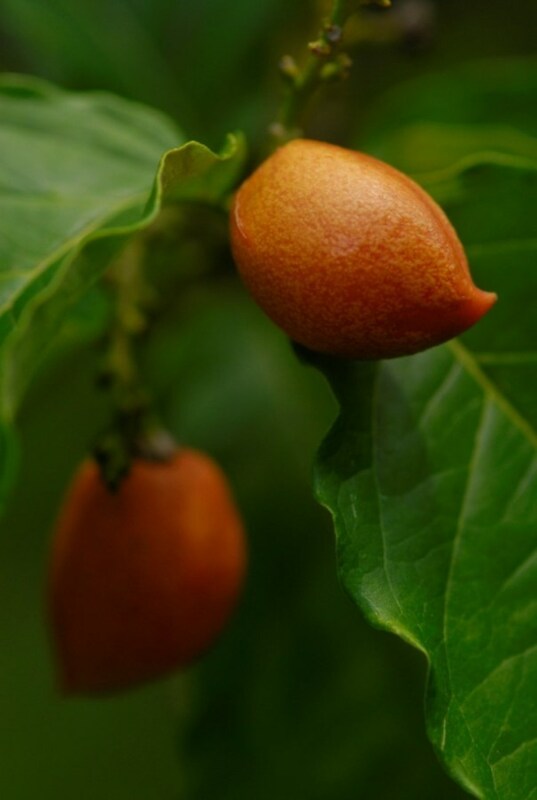 While we expect tropical fruit to grow on trees, there are a large number, which come from shrubs and even herbs. 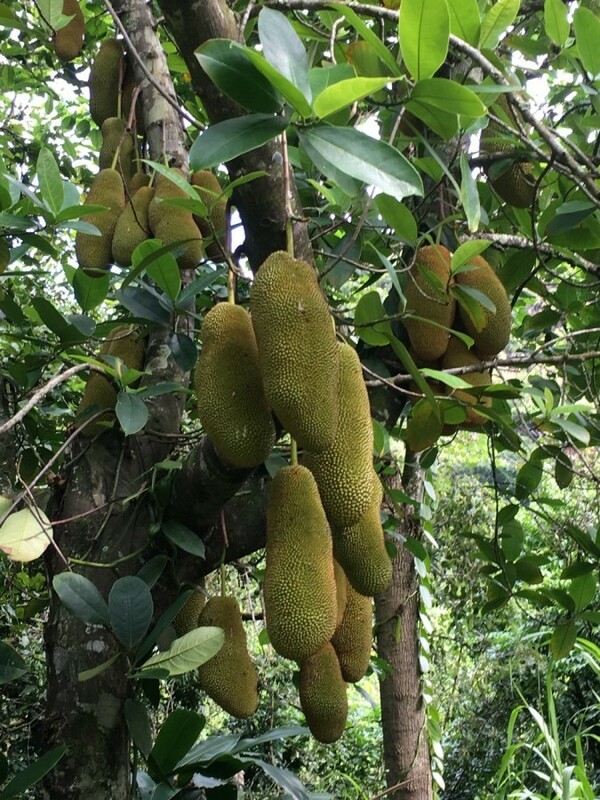 Depending on what time of the year you visit Waimea Valley there will be well-known fruits like mango, guava, and papaya, along with custard apple and rukam, which are equally as tasty but not as well known. 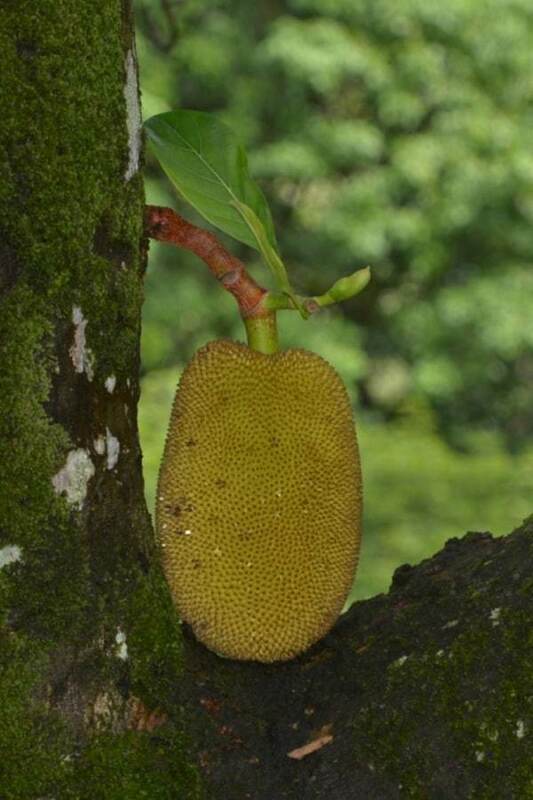 The jackfruit, which grows quite large and can weigh up to 40 pounds. And, a delicious fruit called durian, which has an obnoxious smell. There are also a few subtropical nut and spice trees that grow here, such as the macadamia nut and the Brazilian chestnut trees. There are nearly 1300 species of ginger widely scattered through the tropics, with the heaviest concentration found in Indo-Malyasia region. Some are grown for their ornamental foliage and flowers while others yield spices, dyes, perfumes, fiber and medicine. Most of the over 100 species of Heliconia come from Central and South America with a few found in some island of the South Pacific. 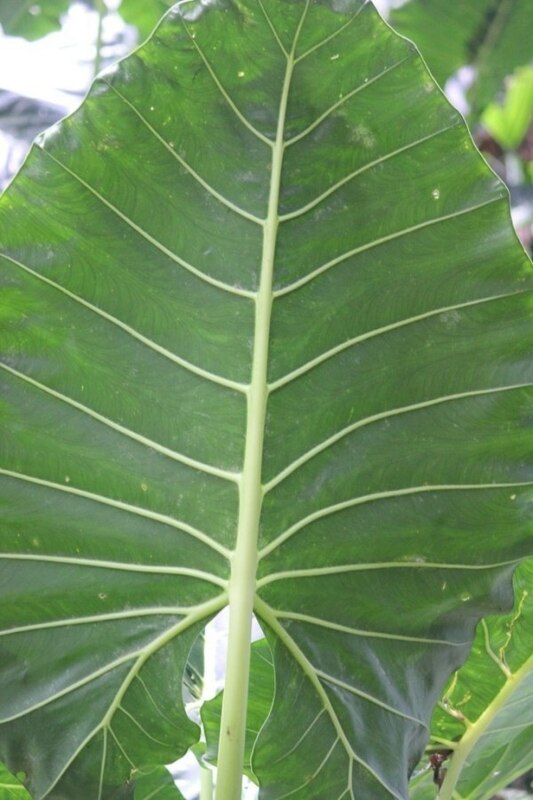 These close relatives to bananas grow up to 20 feet tall, and they are easily distinguished by their long leaf stems from which the colorful bracts rise or hang. Inside each bract, the true flowers are usually tine and inconspicuous. Mariana Islands Guam is the largest and southernmost island in the Marianas chain. It lies almost 3,500 miles southwest of Hawai‘i. The flora of Guam consists of about 350 native species including ferns, flowering plants and one type of cone-bearing tree. 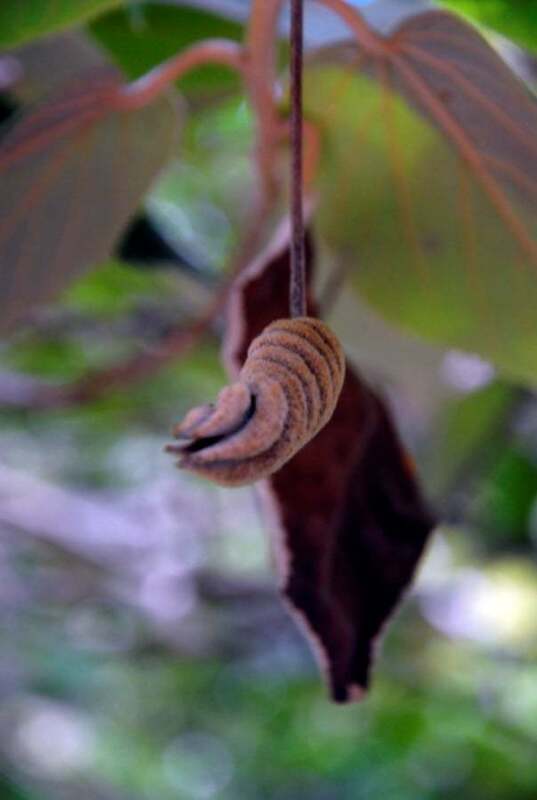 At least 50 of these native species are endangered or threatened, in recent decades by the impact of the brown tree snake, Buigus irregularis, which invaded the island from New Guinea causing bird and insect extinctions which are now having a devastating effect on Guam's flora. There are two distinct types of soil on Guam and certain species can survive only in one soil type. The northern half of the island supports mixed vegetation and consists of a raised limestone plateau and wave cut terraces. The southern half is covered with deeply weathered volcanic clay, which supports mostly native grasses and a few small shrubs. In ancient Hawai'i, plants played an important part in all aspects of life. Plants were not only a food source, but were used in medicines, building, clothing, weapons, and as food containers. 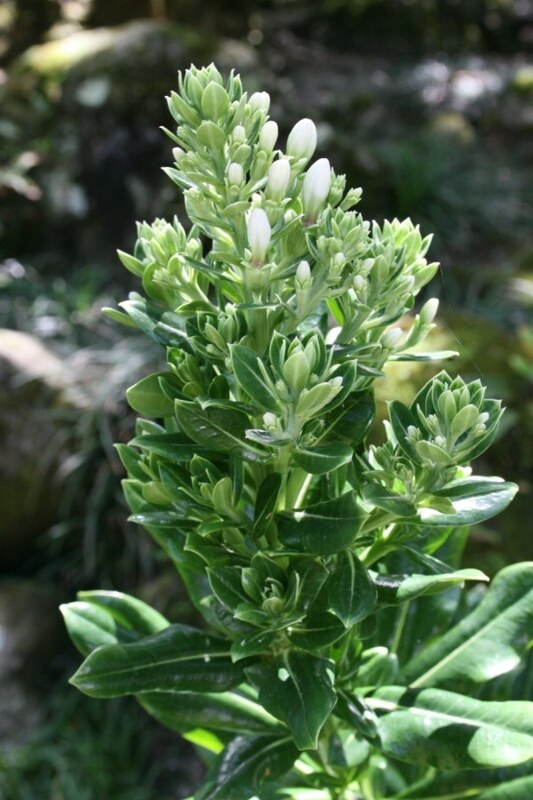 The Kāhuna Nui (High Priest) were skilled in utilizing the plants around them for medicines and religious ceremonies. 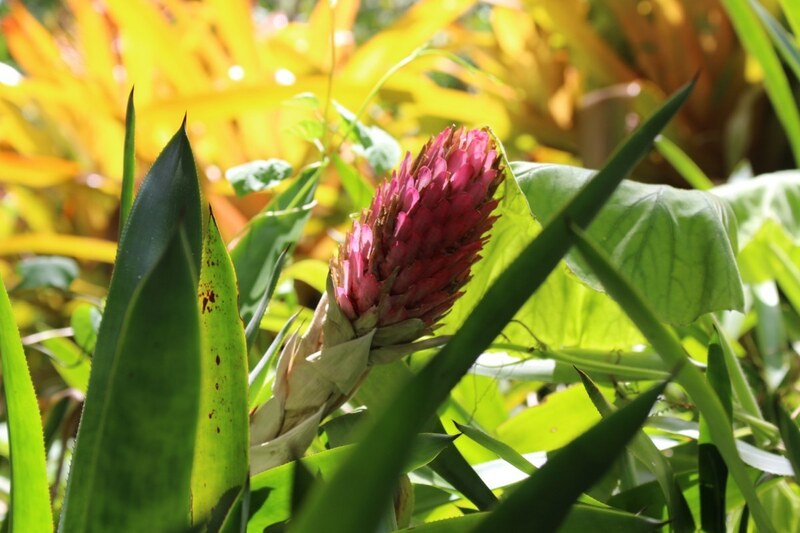 The ethnobotany garden highlights many of the plants utilized by ancient Hawaiians and has individual markers telling the specific uses. The ti plant was used to reduce fevers, while the ginger root was mashed and mixed with salt water for a purification mixture. Kō (sugar cane) juice helped make medicines more palatable. Early Hawaiians used koa wood for building canoes and surfboards, and the wauke for pounding into tapa cloth. Ahuhu leaves were crushed and put in tide pools where it made fish an easy prey by immobilizing them. As you enter this collection from the upper road you'll see an 'ulu (breadfruit) tree, and beyond it are tall, flowering kō (sugar cane) plants surrounding three fenced kalo (taro) plantings. Hawaiian varieties of mai'a (banana) are planted near the kalo beds, and beyond them are two 'ohi'a 'ai (mountain apple) trees from the South Pacific, which fruit twice a year. The ground covers under the sugar cane are varieties of 'uala (sweet potato). These can be recognized by their flowers which resemble miniature morning glories which are closely related. 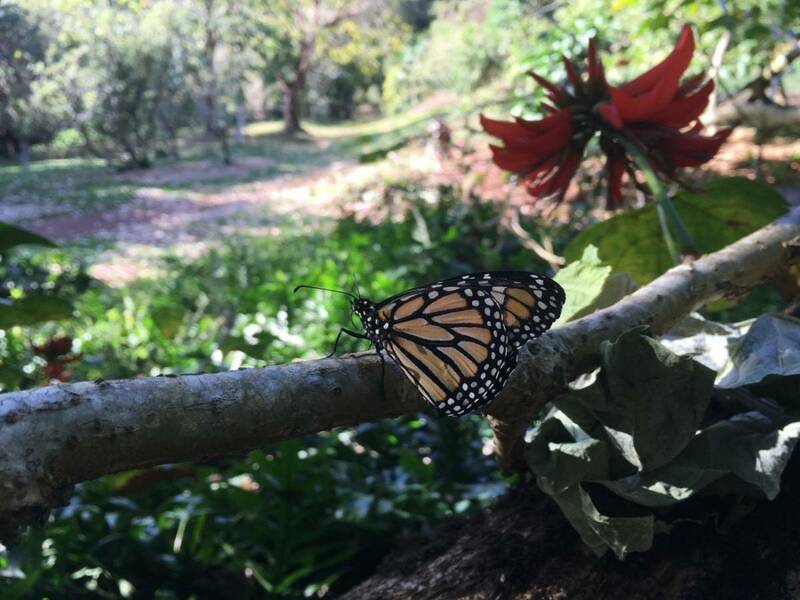 The Hawaiian Flora garden is part of Waimea Valley's effort to provide protective cultivation for our rarest native plants, studying propagation techniques and keeping accurate records, all in hope of restoring self-sustaining plant communities for future generations to enjoy. The rich flora of Hawai'i is descended from a small number of pioneering ancestors, all of which arrived by wind, wave, or wing. Most evolved into new species so that today over 90% of our Hawaiian plants are found nowhere else, the highest rate of endemism in the world. Although the early Polynesians cleared land for cultivation, for the most part they co-existed with nature and these important habitats. It was not until the arrival of the Europeans that the delicate balance of nature was disturbed. The process of clearing land for plantations and the introduction of goats, cattle and deer all took their toll on Hawai'i’s plant life. 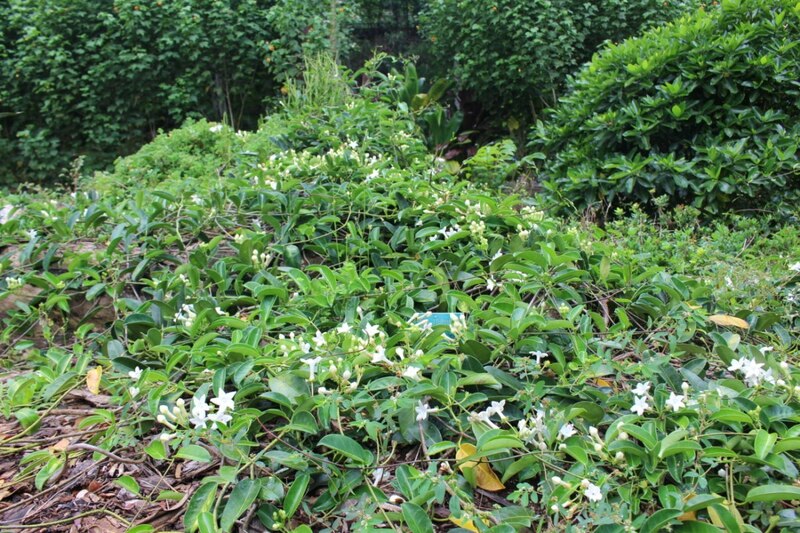 There are three large gardens in the Valley devoted solely to Hawaiian plants. The largest and oldest, Hawaiian A, surrounds Pond 2, which can be found past the ticket booth to the first bridge. About a third of the way up the Valley, above the upper road, is Hawaiian B which gets morning light, but is shaded by the steep Valley wall by mid-afternoon. The newest, Hawaiian C, is in full sun and has been planted in the Makai end of the Erythrina Collection behind the oracle towers of the Lono Heiau ( a Hawaiian temple whose rock work has been carbon-dated to the 1400’s) visible from the main parking lot. The genus hibiscus adds a great variety of color to the Hawaiian flora. 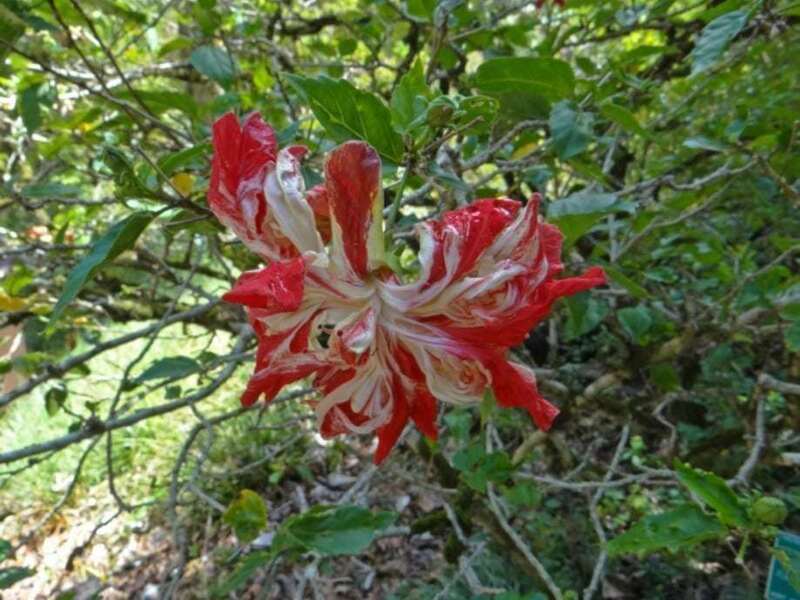 Surprisingly, the bright red Hibiscus kokio flowers are descended from the same pioneer ancestor that evolved to become our two white-flowered species: H. waimeae from Kaua'i named for Kaua'i’s Waimea Canyon and H. arnottianus found on O'ahu. These two native whites, Koki'o ke'oke'o, are the only hibiscus in the world that give off a faint perfume at dawn and dusk. 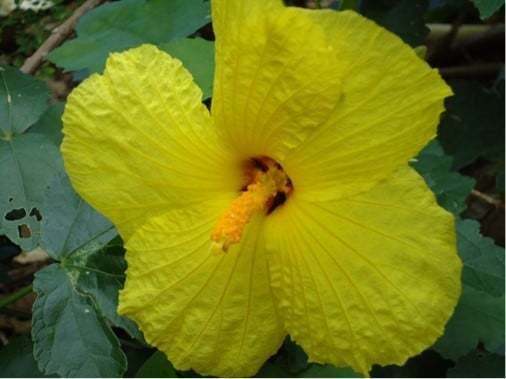 In the late 1980’s the bright yellow-flowered endemic Hibiscus brackenridgei, Ma'o hau hele, became the state flower. This endangered species survives in the wild in very few places. Fires in 2007 impacted the already limited range of the O'ahu subspecies Mokuleianus. Lana'i’s last few plants are not doing well, but several collections are growing well here in the Valley. The Hawaiian Hibiscus collection at Waimea Valley is large. The four sections are separated by roads and paths starting at Hale 'Iwi and extend down to the main road makai (toward the sea) of the banyan tree. 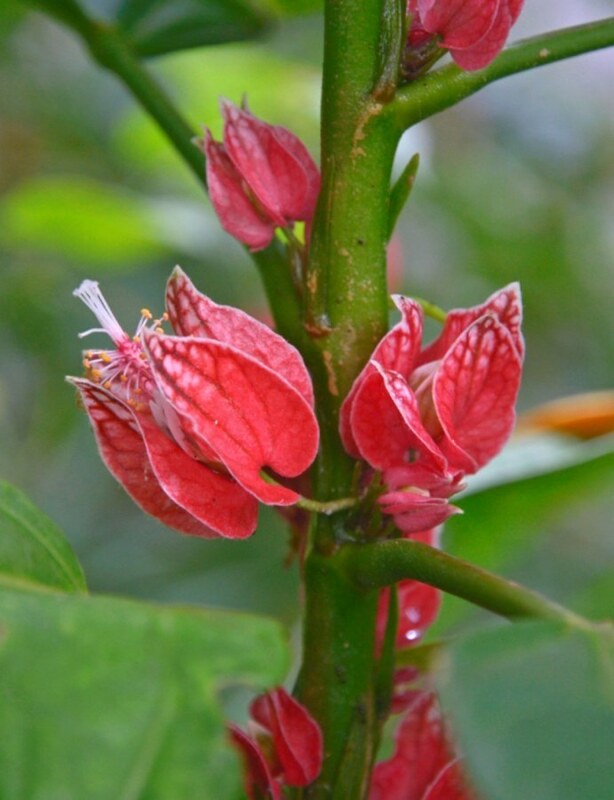 The Hibiscus Hybrid garden of winding paths can also be called the “Early History of Hibiscus Hybridization”. 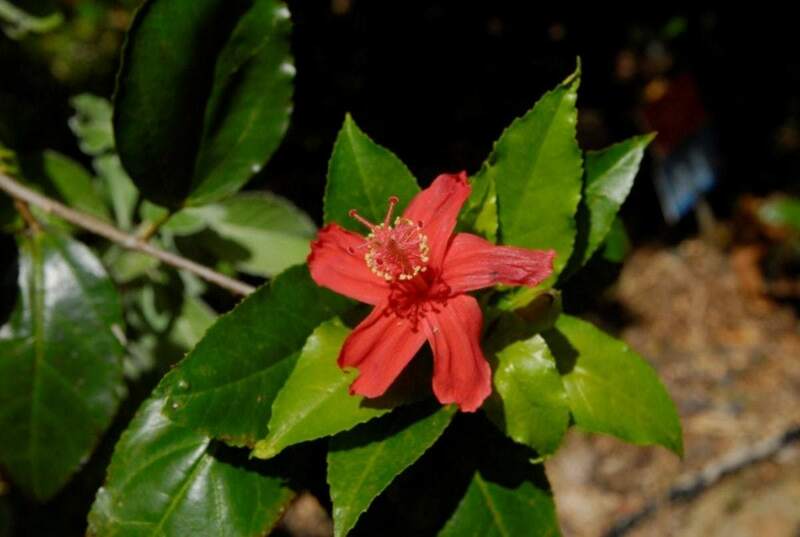 Sub-gardens along the trail feature the early bloodlines – from Australia, the Mascarene Islands, and Fiji which were crossed with Hawaiian hibiscus to produce new hybrids. 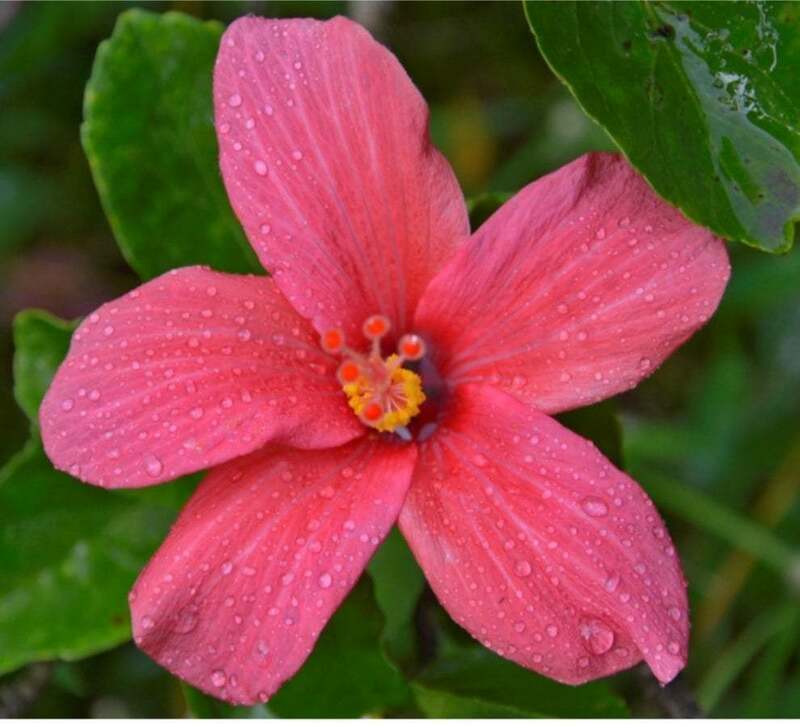 "Nasilai Pink‟ is the name given to a cultivated variety of Hibiscus found in Fiji. 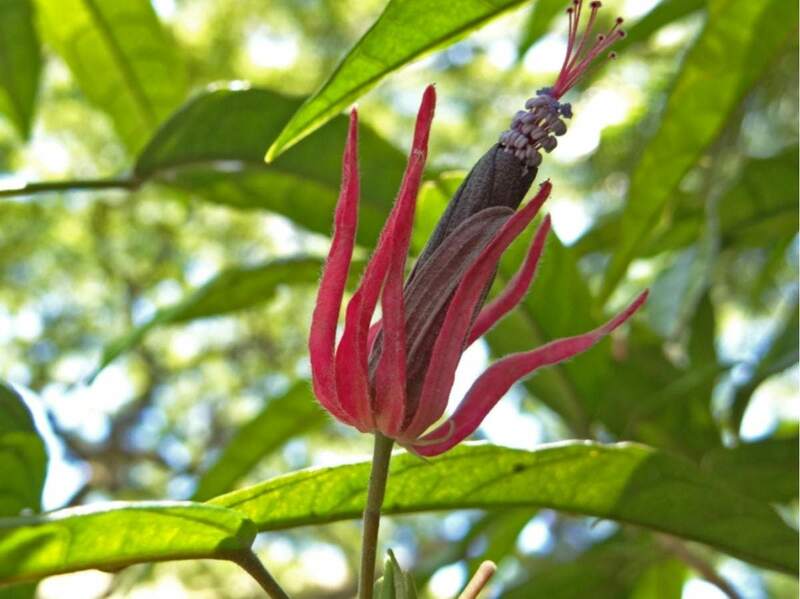 It may be closest to a legendary species, Hibiscus storckii, which has probably gone extinct. 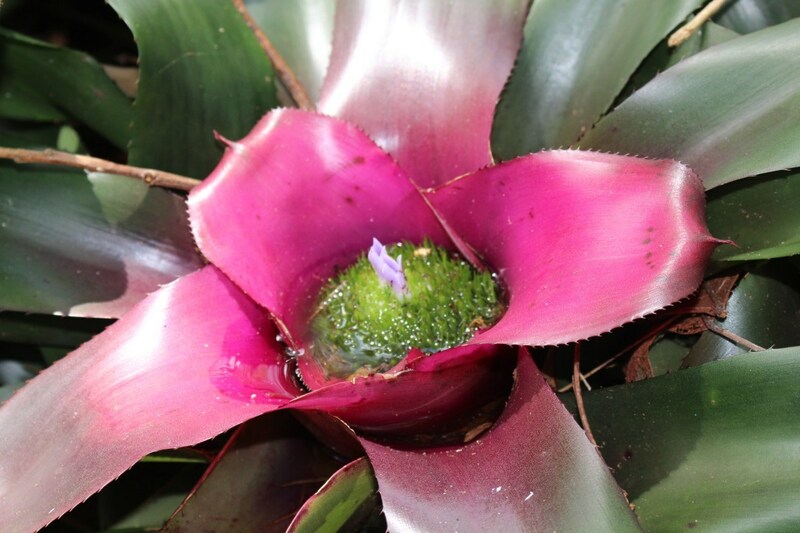 Waimea sent a horticultural expedition to Fiji in 1984 looking for this lost plant. 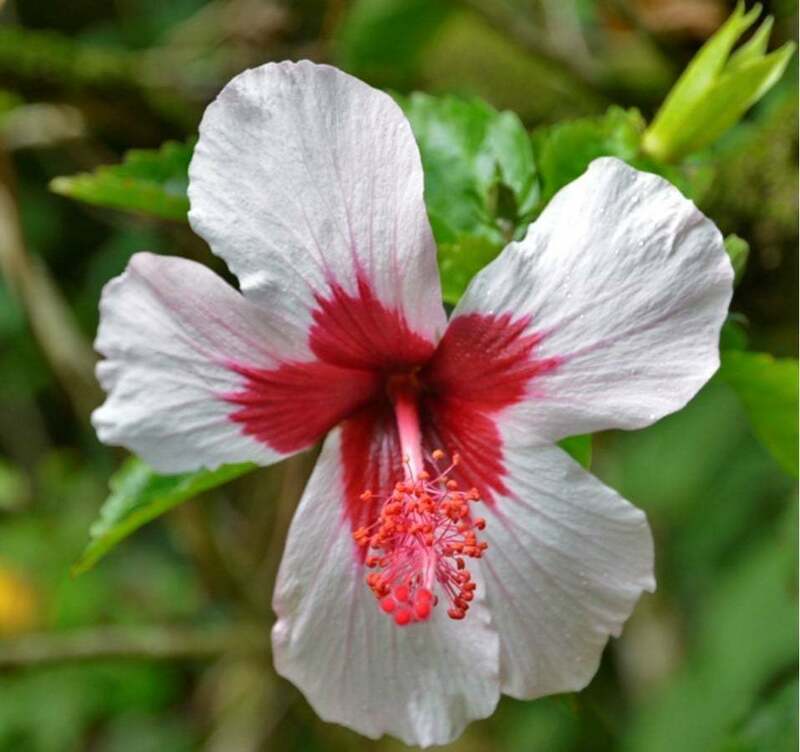 Most Fijian hibiscus have an “eye” where the colors in each petal are dark towards the center of the flower. Thirty years ago most plants in this garden were considered part of the then-giant Lily Family. Plants are put into different families according to their floral structure, but so many other factors are involved today: DNA, pollen and seed morphology as well as the fact that botanists can compare a wider range of plants than ever before. Nature rarely conforms to man’s categories. There are always exceptions, and when too many exceptions pile up, it’s time to reconsider what defines certain plant families. MANY OF THE PLANTS IN THIS GARDEN ARE DROUGHT-TOLERANT ORNAMENTALS, RECENTLY MOVED TO THIS PLANT FAMILY. Ti plants, Dracaena and Sansevieria all used to be in the Agave family and were considered part of the Lily Family before that. In Hawaii the aloe and ti plant are probably the best-known planted in this garden. The thick, bitter substance in the aloe’s leaves soothes sunburns and is a home remedy for many skin problems. The ti plant served a myriad of purposes in the lives of the early Hawaiians –thatching, food wrappers, footwear, even an alcoholic beverage, ‘okolehau, was brewed from its roots. Lord Howe Island lies near the midpoint between Sydney, Australia and the northern tip of New Zealand. This narrow seven-mile strip of land with a few neighboring islets is an important nesting area for migrating birds. A large part of Lord Howe Island is now a nature reserve. Like most isolated islands, a unique flora has evolved, which is endemic to the area (i.e. found nowhere else). Although some destructive animals such as rats, goats, and pigs have been introduced, the endemic flora and fauna is largely unspoiled, and so the island is of great importance to both scientists and nature lovers. Apart from two species of lowland palm (Howea), the plant life is little known outside the island, and this garden is an attempt to bring into cultivation some of these fascinating and unique plants. Madagascar, the world’s fourth largest island, broke away from the African continent 105 million years ago, and the flora and fauna that have evolved in its isolation are among the most remarkable in the world. It is second only to Hawai'i in its rate of endemism, the occurrence of species found nowhere else. New plant species are found every year in the dwindling eastern forests, today less than a third of their original size. Unique families of swollen spiny plants, unrelated to cactus, dominate the dry central plateau. Tragically, much of the flora is being lost to firewood collecting. The country’s severe overpopulation and poverty have made conservation of its priceless botanical wealth almost impossible. An intensive international rescue effort led by the World Wildlife Fund is underway. 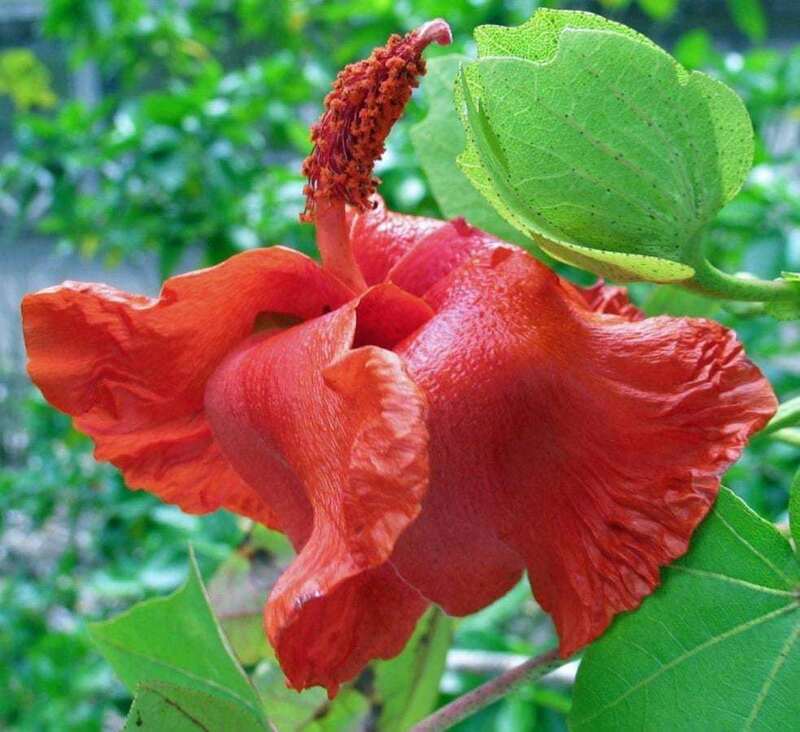 The ornamental hibiscus hybrids are the best known, but there is great diversity and beauty in these wild hibiscus species and their relatives, which include cotton and okra. 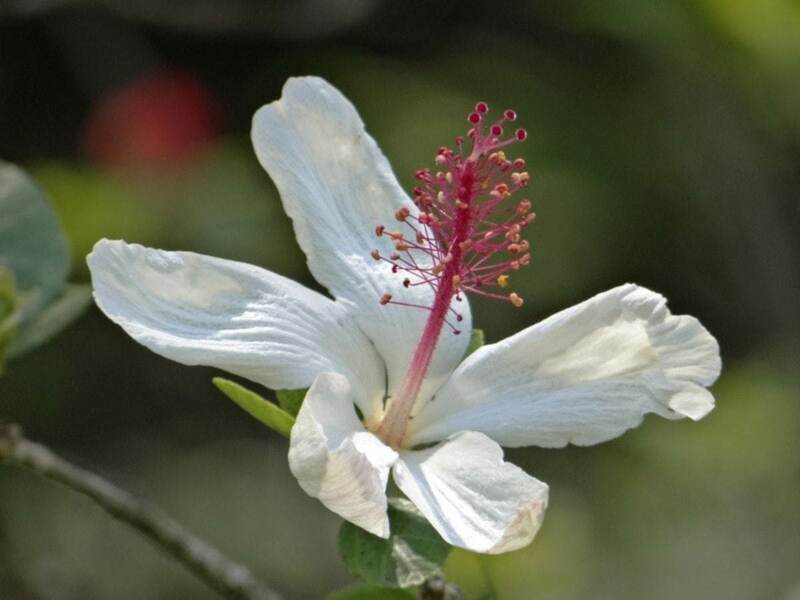 Of all the different hibiscus species in the world, only the two white flowered endemics (Koki'o ke'oke'o) found in Hawai'i have a fragrance. There are about 300 species from tropical and sub-tropical areas. 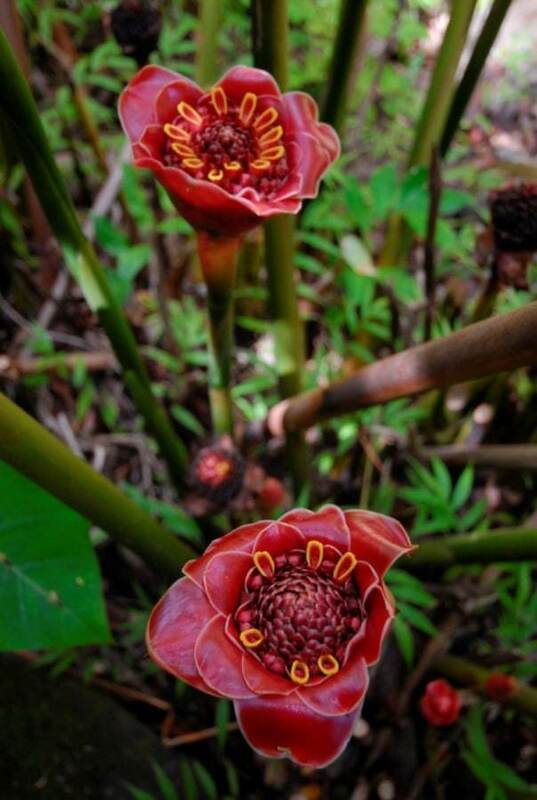 Thanks to Dr. David Lorence of the National Tropical Botanical Garden on Kaua'i, Waimea has one of the best collections in the world of plants from these remote islands. Dr. Lorence sent seeds and plants to our nursery since the 1970s. The two main islands Mauritius and Reunion are located about 500 miles east of Madagascar in the Indian Ocean. The isolated position of these islands has produced unique forms of both plant and animal life, but the islands have suffered from the ravages of introduced animals (mainly goats) and from land clearance for tourist and agricultural purposes. Most of the plant and animal life depended on undisturbed habitats and are now facing extinction. 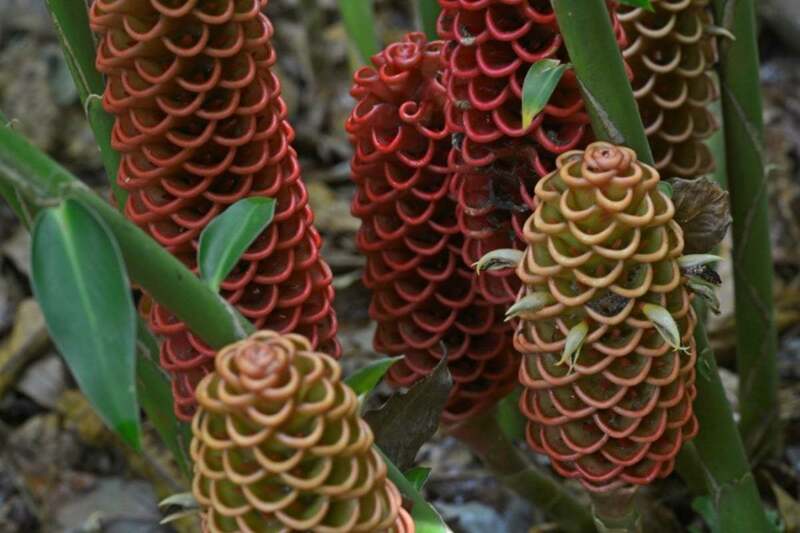 Some of the rarest and most unusual plants in the world are found on these islands. A characteristic of many species is the presence of two distinct leaf shapes on the same plant (called heterophylly). This is especially noticeable in the hibiscus on these islands. The economically valuable banana originated in the Old World tropics; Musa is the main genus in the family and has over 40 species and some 300 clonal varieties. Used for food and fiber, the banana is widely cultivated throughout the warmer parts of the world. Less sweet varieties intended for cooking are called plantains. A banana plant cannot be called a tree, as it has no wood. It flowers only once and then dies. Though a few species produce viable seeds, most are cultivated by replanting the new keikis (small plant) that form at the base of the parent plant. Bananas were first brought to Hawai'i from the South Pacific by migrating Polynesians. Some of the cultivars bred by generations of Hawaiian farmers can be seen in the Hawaiian Ethnobotany Collection. Our native fern garden, established recently is located next to the Pikake Pavilion. 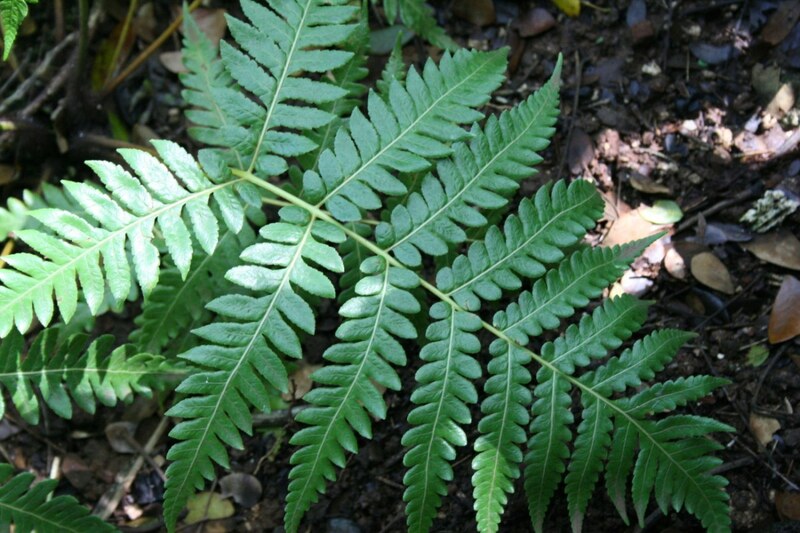 One sixth of Hawai`i's native flora is in the pteridophytes. 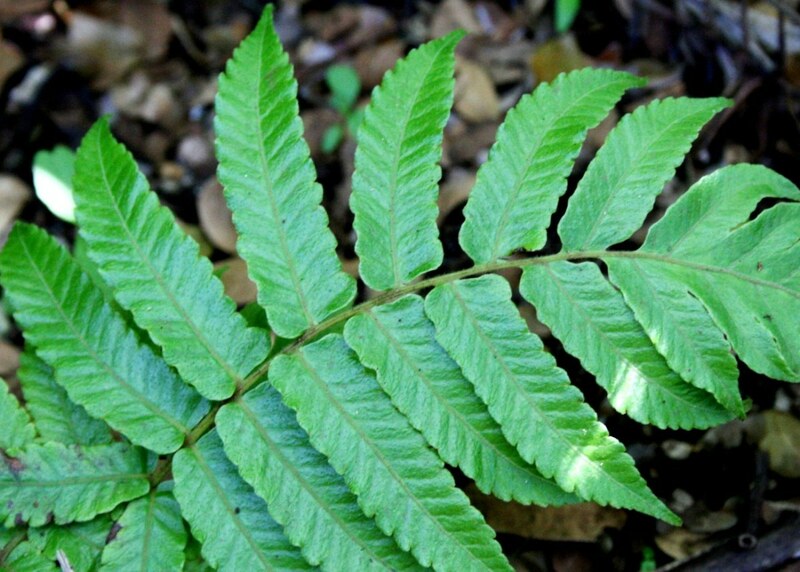 The well-known endemic tree fern, hapu'u (Cibotium chamissoi), is commonly found in mesic to wet forests of O'ahu. Other species of hapu'u dictate at higher elevations. 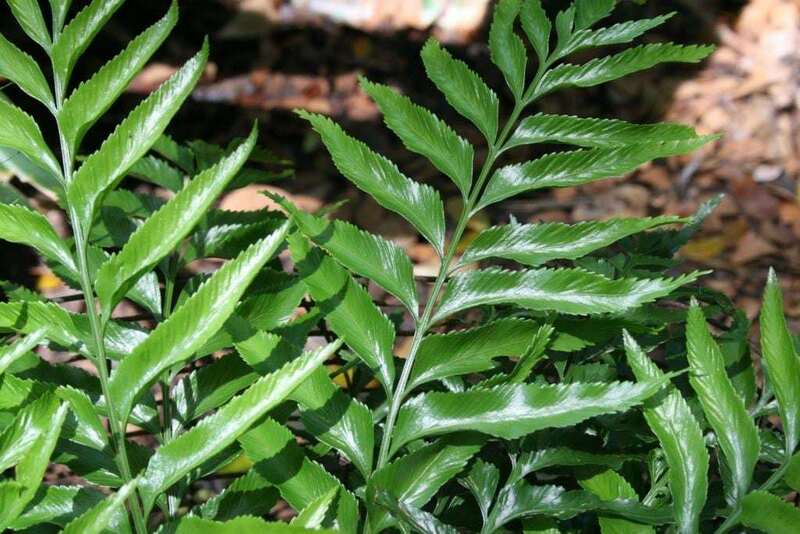 We are encouraging Hawai'i residents to plant the endemic tree fern in lieu of the invasive Australian tree fern that is used commonly for landscaping. In the wild, the hapu'u is threatened by feral pigs that eat the new growth, some plants were cut down for their fibrous trunk used for decoration, or to mount epiphytic plants on them, such as orchids. Ferns are a crucial part of the Hawaiian culture. In lei making, fronds are used abundantly. It is mentioned commonly in song and chant as well. This remote group of about 31 islands and rocks, located 600 miles south/southwest of Tokyo are at about the same latitude as Hawai'i. Students of Hawaiian evolutionary botany learn much from the similar flora of the (almost uninhabited) Ogasawara Bonin Islands. The climate is comparable to the lowlands of Hawai'i but with a rainy season from April to July. 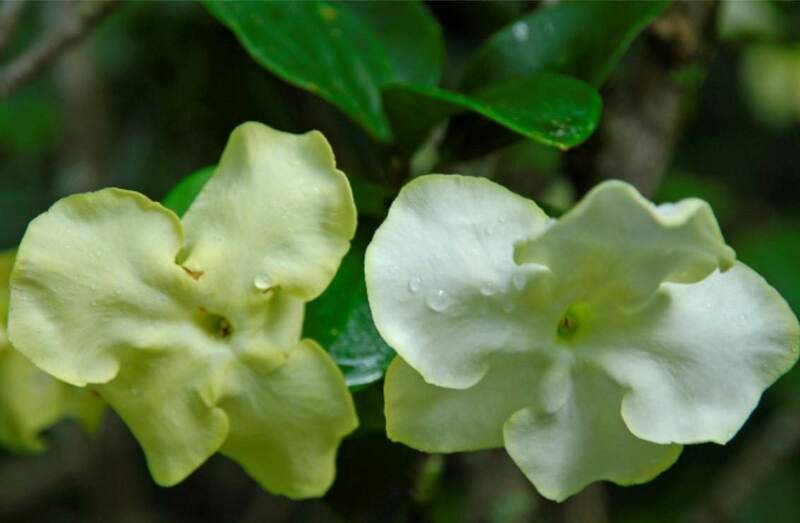 There are some similarities in flora, including 26 species from the Ogasawara Islands, which have relatives within the Hawaiian flora. The location of the islands provides an interesting mixture of temperate Asian and tropical Pacific plants. There are nearly 400 species and 46 percent are endemic, meaning they are not found elsewhere in the world. There were many unsuccessful attempts to colonize the islands since the mid-16th century. In 1830, a ship from Hawai'i landed a crew of 20 Hawaiians and 7 Europeans, where they settled under the British flag. Descendants of these Hawaiians spoke an old form of the language and were still building double-hulled sailing canoes when they were rediscovered at the start of WWII. Scattered across the vast Pacific Ocean, uninhabited isolated islands allowed plants to evolve in strange and wondrous ways. Rapid geological changes from volcanic activity, storms, and tsunami were as effective as the shower of forces of erosion, coral accretion, and sea level change in shaping these often ephemeral land masses. On most islands, prevailing winds account for widely varying climatic zone. The Marquesas Islands and French Polynesia are ancestral homes to the voyages who found and populated Hawai'i. 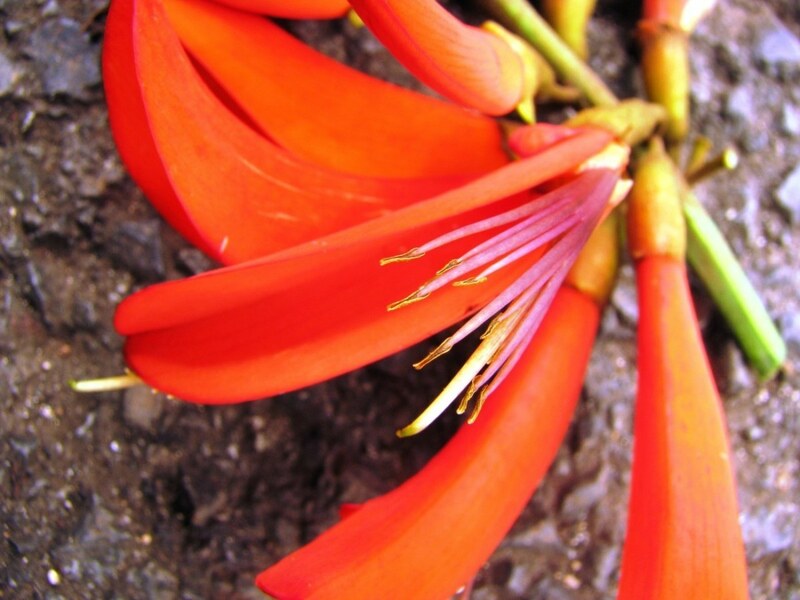 Some of the oldest flowering plants in the world are found in Fiji. As human traffic spreads to still-pristine Pacific habitats it is important to protect what remains. 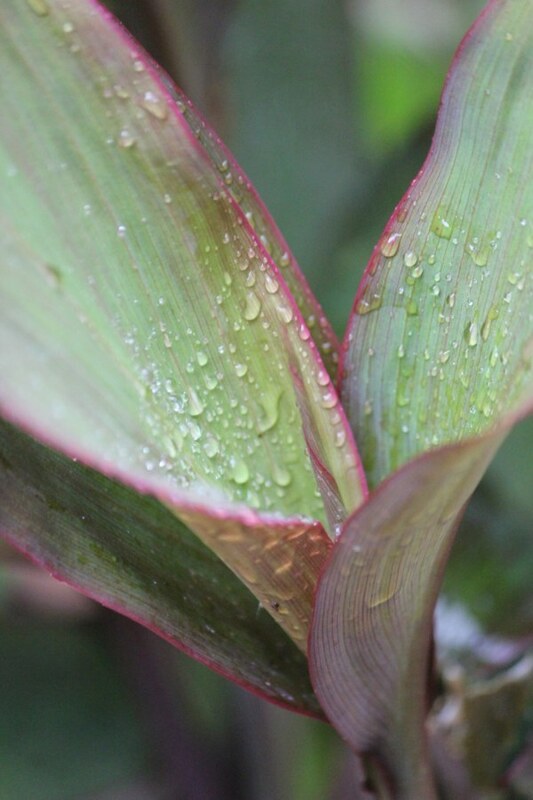 Aside from all of our Hawaiian gardens, four other collections at Waimea Valley focus on Pacific plants from Fiji, Guam, Lord Howe Island and the Ogasawara Islands. 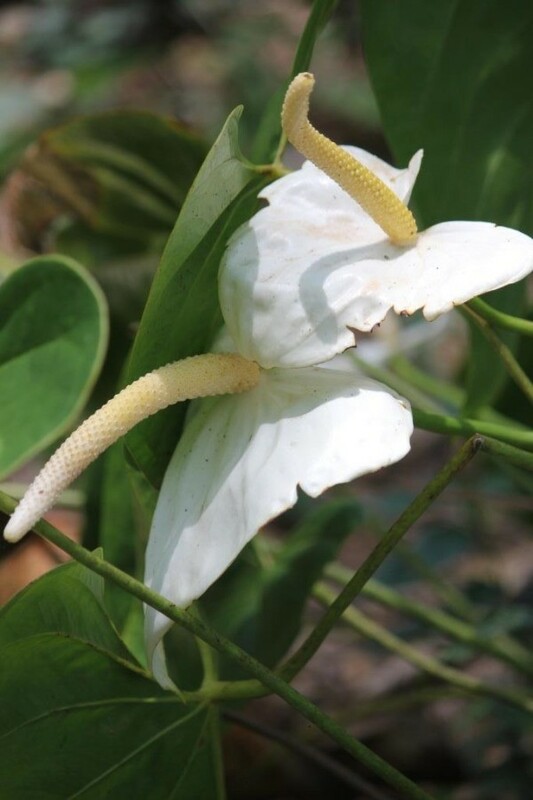 Two of the most easily recognized members of this pantropical family are piper woody climbers on shrubs including some trees, and peperomia, low herbs that are popular as houseplants. All of these plants have jointed stems and inconspicuous flowers born on spikes. The condiment, pepper, comes from one of the 2,000 or more species of piper. The fruit of Piper nigrum can be ground whole to make black pepper or the outer coating can be removed first to yield white pepper. A close relative is Piper methysticum, called 'awa in Hawai'i where over 15 varieties were once cultivated, or kava in other parts of the Pacific where its traditional use remains a central part of many cultures. A mixture of the pounded roots and water is consumed ritually, medicinally, or as a mild intoxicant. 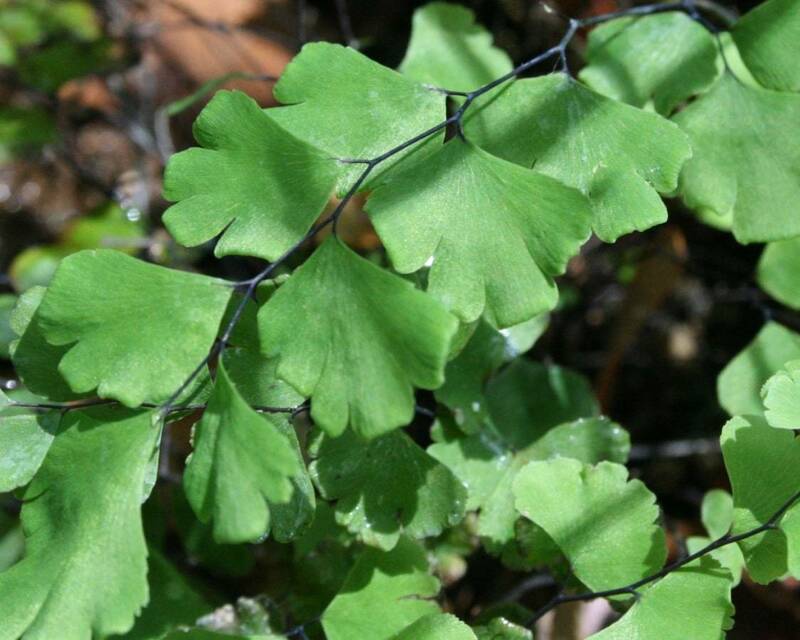 Of the 1,000 or more species of peperomia some are found only in Hawai'i. Some were used in medicine and in the manufacture of a gray dye for staining tapa cloth. Ornamentals like the jade plant and the watermelon peperomia are widely used as potted plants. These prefer cool, moist conditions for optimal growth. The Seychelles are group of 115 islands and atolls in the Indian Ocean about 600 miles northeast of Madagascar. The remote granitic archipelago was one of the last tropical places in the world to be discovered and colonized. The total land area is only 175 miles, but a rich endemic flora includes the fabled coco-de-mer, the strange palm with the largest seed in the plant kingdom. Several wild-collected endemic Pandanus species are fruiting at Waimea, and you can see the bizarre, spiny Verschaffeltia palm supported by diagonal stilt roots at its trunk tapers to nothing. Of all the island groups in the world, the Seychelles have had the longest continuous era of plant immigration and evolution before the first human settlements in the 1770’s. This collection is only a fraction of the 90 or so plants unique to the Seychelles. 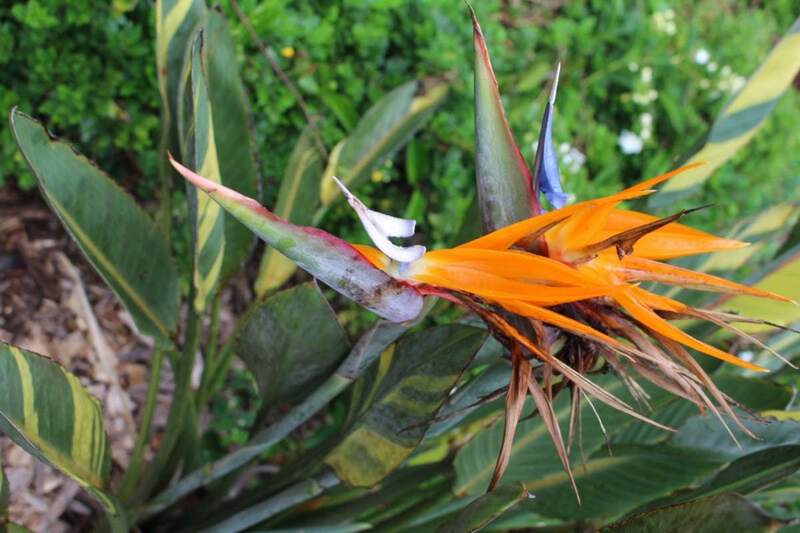 All were grown from seeds or cuttings collected from the wild areas of the islands and sent to Waimea Valley. The teardrop-shaped island of Sri Lanka was once connected in ancient times by a land bridge to the subcontinent of India. Formerly named Ceylon, the island was a crossroad for centuries in the spice trade with the Far East. The earliest myths refer to it as “the land of Serendip”. At one time it was a powerful Buddhist center of learning that sent missionaries as far as Japan. 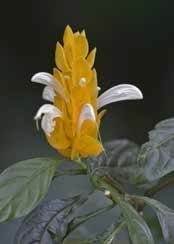 With so much cultural exchange, many exotic plants of ethnobotanic importance have been introduced into cultivation such as tea, fruit, spices, timber, and a vast number of medicinal plants. Many of the lowland flora are similar to those found in India. However, threatened, endemic flora remain in the central highlands, now largely given over to tea plantations. Some of the plants in this collection have grown from seeds and cuttings collected from the 170 year old Royal Botanical Gardens at Peradeniya, Sri Lanka. 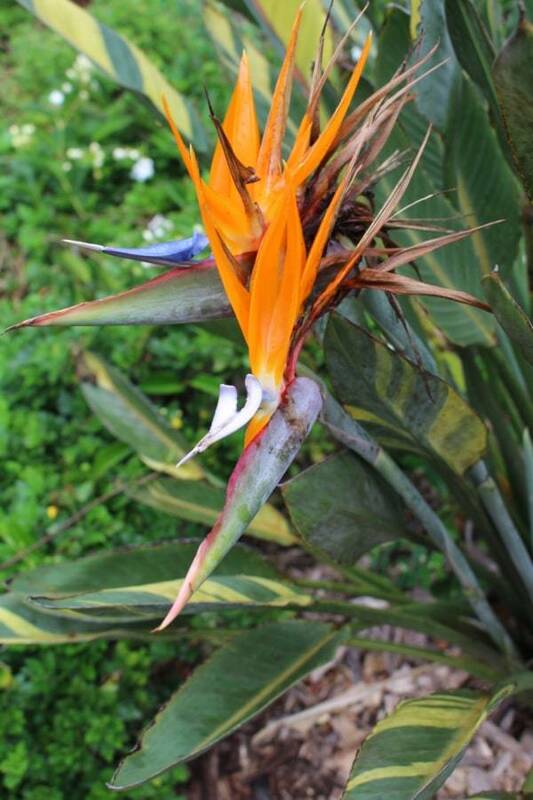 The beautiful bird of paradise flower from southern Africa is the most familiar member of this family. 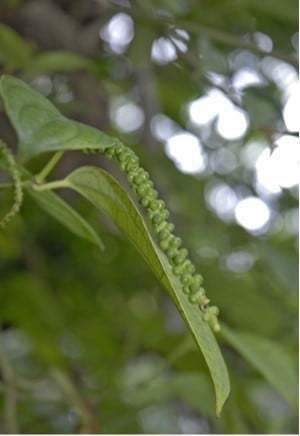 Also included are the South American Phenakospermum which can grow to a height of 35 feet and the distinctively fan-shaped Ravenala commonly known as Travellers Tree from Madagascar. 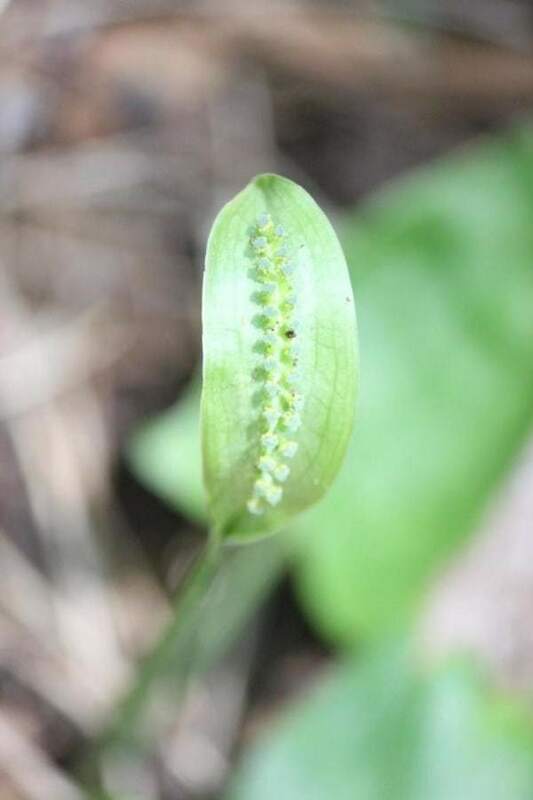 Thirsty travelers could tap water from closed cavities that help support its leaf blades.